Have a Karaoke set up and let the boys and siblings ham it up with a BSA Idol competition as they arrive. Set up your space derby racer and have the boys play with either a few pre-made racers or have the kits there and they can make them and use them. Get ideas for folding paper and creating different paper airplanes from the web. Let them fly their airplanes to see how they go. Have nametags made up using five constellations. 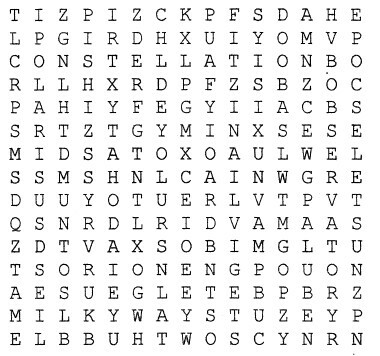 How many 3 letter or more words can you find in the word, constellation? Shooting stars are fun to find and watch. For the pre-opening activity have the Cubs pack an egg so that it can survive a ten foot (large) drop onto a hard surface. Materials: Eggs, Ziploc bags, tape, Styrofoam sandwich box, packing materials such as cotton, newspaper, peanuts, grass, leaves, etc. Then pack it any way you want inside the box. Tape the box well and write name on it. Then check to see whose egg survived. Try your luck at navigating this real hedge maze. 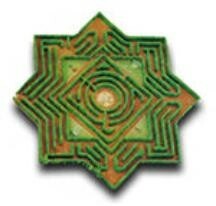 The Bellingham Maze is located in Queensland, Australia, and you can walk through it from the left-most point of the star and get to the right-most point…if you dare.